Like many children I initially equated green food as “bad” tasting food, without even tasting them. On Saturday mornings you could count on me being mesmerized by the cartoon “Popeye”. 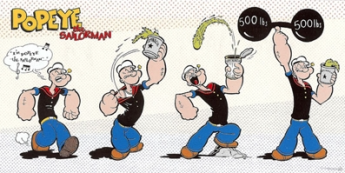 And Popeye immediately became super strong whenever he ate his spinach. While spinach has a lot going for it nutritionally, instant muscles is a real stretch. But to my childhood brain, it didn’t matter. It was on TV, so it must be true (yes, this was before the Internet). I was small for my age and not athletically inclined, so I devoured spinach in hopes of someday looking like Charles Atlas. Even though spinach was green, its color was trumped by the association with the instant power it gave Popeye. I see this same linking with my grandchildren, who love broccoli, because they think that they are eating “little trees”. I linked a rainy day with impending sheer joy! Thanks, Popeye – even though you didn’t deliver on a ripped body, you taught me a very valuable life lesson!